The Night Mother is a unique legendary Neutral support card. It is part of the Dark Brotherhood story set. 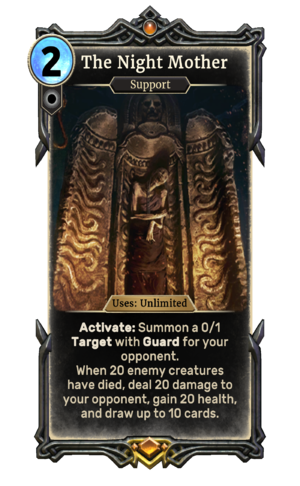 A playset of the card is awarded for completing Night Mother's Crypt Part 2. The premium version can currently only be obtained by soul-summoning, which is only possible after the completion of Night Mother's Crypt Part 2. The premium version was originally available as part of The Fall of the Dark Brotherhood Prepurchase promotion. The Night Mother is an important figure within the Dark Brotherhood. The depiction in the card's art is how she appeared in Skyrim.